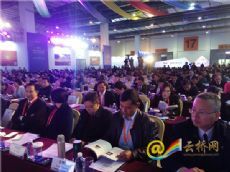 The 2017 Lancang-Mekong Subregional National Commodities Exposition, also Dianchi Forum for Lancang-Mekong Cooperation, opened at Kunming Dianchi International Convention and Exhibition Center, Yunnan Province this morning. With the theme of co-consulting new initiatives, co-building new mechanisms and co-winning new development, the opening attracted hundreds of officials, diplomats, business delegates and exhibitors from China, Vietnam, Laos, Myanmar, Thailand, Cambodia and other countries. In the opening remarks, Gao Shuxun, Member of the Party Committee of Yunnan Government believed that through joint efforts of the six countries the prospect of the Lancang-Mekong Cooperation will be better and better. 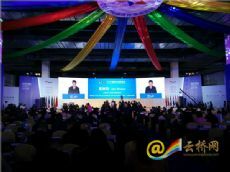 "The six countries form natural cooperative partners, close neighbours and trustworthy friends," said Zhang Wei, vice president of China Council for the Promotion of International Trade, adding that in the coming fifteen years China will draw in around 2000 billion USD foreign investment, while investing around same amount to neighbouring countries. Currently, around 100 million Chinese travel abroad annually. Chinese tourists to Thailand may exceed ten million this year, and Chinese tourist to other Mekong countries are on the increase. Cao Jing, consular and national coordinator of Chinese Secretariat of the Lancang-Mekong Cooperation, said through the mechanism more tropical fruits and agricultural products will be imported into China, while more Chinese industrial products like iron and steel will be exported to neighboring countries. Chhuon Dara, state secretary with the Cambodian Ministry of Commerce, thanked Yunnan government for kind invitation and warm hospitality, adding China-Cambodia trading and cultural ties are on the rise in recent years and wishing the Dianchi forum a big success. 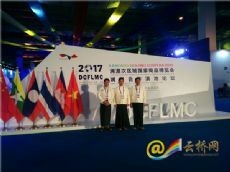 Sisouvong Khkenthong, vice-chairman of China-Laos Friendship Association, together with other international guests, also shared their ideas on Lancang-Mekong cooperative mechanism at the opening ceremony.